Hay Bro sis ...Toyota Alphard MPV and luxury Vellfire model is most popular in Indonesia. PT Rema TipTop Indonesia, manufacturer of vehicle safety systems, the release of No Doubt Smart Control System, a system remote control car newest edition of No Doubt Luxury products specifically for Alphard and Vellfire. The fact that most of the Alphard and Vellfire more often driven by the driver the reason No Doubt released a product that can control and track the whereabouts of the car remotely. The product package No Doubt Smart Control System equipped with smart processors that are easy to install and claimed will not interfere with the electrical system in the car. 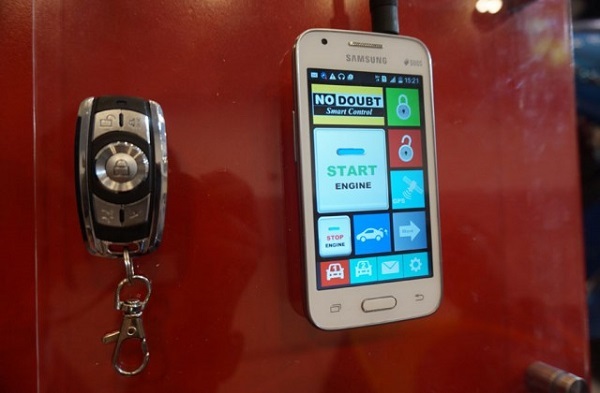 Uniquely, this device can also be controlled through Android and iOS smartphones. This product addition can function as a remote car that can also turn on and turn off the engine, also can track the position or the presence of a car with a GPS connected. There are more than 52 advanced features that can be used as needed. "There's also the Speed ​​Limiter feature that can be activated via smartphone, to avoid a speeding car driven basis, in order to be safer while driving," said Burhan Henson, General Manager of Rema TipTop Indonesia about the products which cost Rp 16 million. These products can be obtained with a promo price of Rp 14 million for exhibitions in Indonesia International Motor Show (IIMS) and Gaikindo Indonesia International Auto Show (GIIAS) in 2015 which lasted until August 30, 2015. Additionally, No Doubt also released a similar product that can be applied on a Harley-Davidson motorcycle. For this one, can be obtained at the price of USD 8 million. While No Doubt application can be downloaded for free from Google PlayStore and Apple AppStore.